After Mia Rapolla scored 34 points against Windham in the quarterfinals, it was up to McAuley to stop her in their semifinal match-up. They did just that, and shut out the rest of the Rams as well in a 39-30 win. Neither team could score for the first 3+ minutes of the game. Alexa Coulombe scored 4 points in the quarter as McAuley led 7-6 at the end of the first quarter. Rapolla hit a 3-pointer and a free throw, but also missed a handful of shots. Gorham went ice cold in the second quarter when the Lions took control of the game. A Lexi Merrifield basket was all Gorham could muster, as they were outscored 14-2 in the quarter. Rebecca Knight had 6 points for McAuley, and four other Lions had baskets. 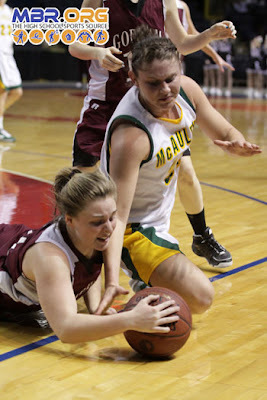 It was McAuley with a 21-8 lead going into halftime. Rapolla started the second half on the bench to tend to what appeared to be a sore ankle. When she checked in, she came on strong with lay-up and then hitting 2 free throws. Rapolla scored the only points for Gorham in the quarter. Knight and Coulombe scored 4 points a piece as McAuley was up 32-16 heading into the fourth quarter. Gorham opened the quarter with a 9-0 run to breath new life into the game. The Rams just ran out of time and opportunities, and McAuley did just enough to keep a safe distance. Knight finished with 12 points, while Coulombe had 11 and was named the Capt'n Eli's Soda Player of the Game. Rapolla had 18 points in a gritty effort for Gorham. McAuley will now face Deering in the Western Maine Final on Monday night.